GRAFENWOEHR, Germany — The European Union’s laws forces clean air and the reduction of air pollution. Every citizen has the right for clean air and if they deem the air pollution unsafe, they can take the state to court. Several cities installed pollution measurement devices in critical high traffic areas to monitor air pollution. Currently, Germany is the only country worldwide with Diesel bans. How do I realize it is a diesel ban area and what are the rules? Diesel ban areas have signs posted like in the photo above. The signs usually consists of different elements. Historic cars with an “H”-license plate are not affected by the ban. Depending on the city there are more exceptions, e.g. for handicapped drivers’ or business delivery. Diesel not in the category as stated on the sign can also pass the diesel ban zones. If the sign bans diesel until Euro 5, the ban doesn’t apply to your category Euro 6 car. What is the difference between an Umweltzone und Dieselverbotszone? “Umweltzonen” or environmental zones already exist in many German cities. These areas can be passed with a green sticker on the windshield; it doesn’t matter if it’s a diesel or any other fuel car. 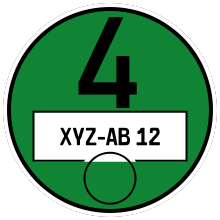 You can get this sticker at almost every car shop if your car complies with the environmental regulations. 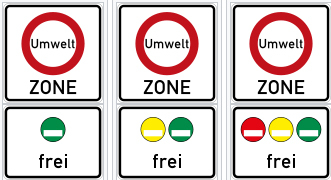 You can pass with the right colors of badges as in the small sign under the Umwelt-Zone sign. Again this is compared to the diesel ban counts for all fuel cars. Can I upgrade my diesel car to enter those areas? Some Euro 5 standard cars could be upgraded by theory, however these technologies are still in development stage. Some kits from third party companies are available but the car companies explicit recommend not to use them. In addition there is no official blue, Euro 6 category out there yet. Which cities bans diesel vehicles? The city of Stuttgart and Hamburg already banned diesel cars. Pending on the rate of pollution, Berlin, Bonn, Darmstadt, Essen, Frankfurt, Gelsenkrichen, Cologne and Mainz will follow later this year. Stuttgart charges 80 euros for violations, Hamburg’s penalties are 25 euros for cars and 75 euros for trucks. I own a diesel in the banned category, what are my options? The easiest way is to use the park and ride options to go down town. 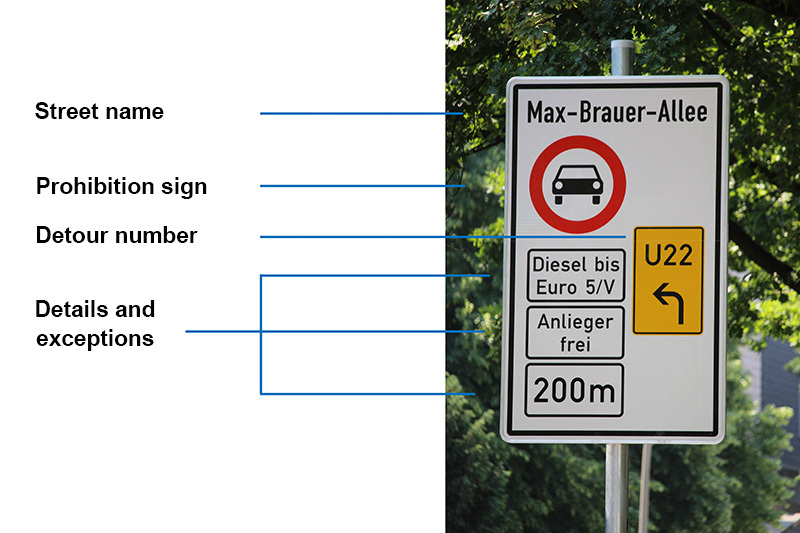 Another option is to use the detour as shown at the diesel ban signs, however some traffic specialists suspect high traffic and more pollution at these long ways around. Green-Zones provides an app with all the information about environmental protected areas for iOS and Android.